Welcome to the launch of the Samsung Galaxy Note 9 - one of the most powerful phones ever to grace this fine planet. Billed as ‘super powerful’, Samsung is going all out to show that the Note 9 is the handset that can do it all… but how does it stack up against the iPhone X, easily the best phone that Apple has ever made? Instead of diving straight into the design, as we normally would with these versus pieces, let’s talk about the headline spec: power. The Samsung Galaxy Note 9 is packing two CPU variants in its mix: the Qualcomm Snapdragon 845 for the US (and possibly a few other markets) and its own Exynos 8910 for nearly everywhere else. Combined with 6GB or 8GB of RAM, we anticipate very little that will slow this phone down - there’s also some intelligent monitoring of the processor to make sure it’s pumping along at the optimum pace. The iPhone X is using the A11 Bionic chip, and packs 3GB of RAM - the most on an iPhone. In our benchmarks, the iPhone was capable of still throwing out around 25% more power than the Samsung Galaxy S9 Plus, which is one of the most powerful phones the South Korean brand has on the market and will use the same CPU as the Note 9, so it will be interesting to see if there’s any optimization there, or if the extra RAM really adds performance. The iPhone X obviously is always using the latest OS on the phone, with iOS 12 coming this fall, and the latest version of iOS (11.4.1) currently residing on many phones. The Samsung Galaxy Note 9 is only using Android 8.1 Oreo, but then again we’d be amazed if it was one of the first to launch with the latest Android Pie that’s pretty new to the market. In terms of storage, this is something that Samsung is making a big deal of: if you go for the 8GB RAM variant, you’ll be getting a 1TB-ready smartphone. That’s 512GB of onboard storage with the space for a 512GB microSD card. There’s also a 128GB model, which can also take that massive memory expansion card, if you want to spend a little less. The iPhone is a little easier to work out: 64GB or 256GB of onboard storage, with no expansion port, to keep things simpler and maintain performance (although Samsung’s seemingly confident it can keep the speed up, even with that extra space). Right, let’s get into how these phones look - and if you’ve seen the Note 8 before, then you won’t notice a whole heap of differences here. The Samsung Galaxy Note 9 is large - but then again, you probably expect that given it’s Samsung’s flagship phablet device. At 161.9 x 76.4 x 8.8mm, it’s a little bigger and at 201g, it’s not the lightest phone on the market. Compare that to the iPhone X, which is only 143.6 x 70.9 x 7.7mm, and 174g, you can see you’re getting a lot more phone with the Note 9. That’s to allow for the massive 6.4-inch screen, which packs in 2960 x 1440 pixels and rounded edges. That’s far more than the iPhone X, which has 1125 x 2436 pixels, meaning a sharpness of 458 ppi, compared to the Note 9’s 516 ppi. Both are using the same Samsung Super AMOLED technology though, meaning excellent contrast ratios and color reproduction. When it comes to opening the phone, Samsung’s Note 9 either allows you to combine iris scanning and facial recognition to enter your handset, or tap the fingerprint scanner on the rear. Apple’s only got the FaceID facial recognition on the front, but we found this to be pretty accurate most of the time. And finally, let’s talk colors: the Samsung Galaxy Note 9 will come in Lavender Purple, Ocean Blue and (in some territories) a black variant. The iPhone X comes simply in silver or space gray… there’s no black option there, so it’s the more business-like of the two handsets. Samsung’s making a big noise about the battery life on its phones, with the Note 9 packing a 4,000mAh power pack inside. The iPhone X comes with just 2716mAh in the mix, but to compare them like for like in terms of battery size would do a disservice to both. The iPhone has always had a smaller power pack to preserve design, but has a more optimized operating system to make sure that it squeezes the most out of the battery. The Samsung’s 4,000mAh battery marks a big jump forward for the brand in terms of capacity for a flagship phone, and shows it’s going to pump out as much juice as possible from its phone as it looks to build on the slightly sub-par battery life of the Note 8. Both of these phones support wireless and fast charging, but the Galaxy Note 9 can accept wire-free power from both Qi and PMA standards, where the iPhone is just open to the former. Both of these phones look similar on the camera front, both offering 12MP dual sensors on the rear of the handset with optical image stabilization. However, while both also have different lens capabilities (one being telephoto, and one wide angle) we’d anticipate the Galaxy Note 9 would be better in low light, thanks to using the same dual-aperture technology we’ve seen on the S9 duo. The Note 9 has a larger sensor size on the wide-angle lens, and that dual-aperture technology can open and shut a small mechanical iris that means it’ll offer either an f/1.5 or f/2.4 sensor, depending on the conditions. The iPhone’s sensors are locked to f/1.8 and f/2.4 aperture, so will be slightly less capable in low light (although both phones are likely to perform pretty well when things get a little darker). The front facing camera on the iPhone X is a 7MP affair, capable of f/2.2 aperture, and the Note 9 offers 8MP with f/1.7 for all your selfie needs. Price - is the Samsung Galaxy Note 9 cheaper? We’re still yet to get official pricing on the Samsung Galaxy Note 9 in all territories, but in the US the Note 9 price is set to be between $999 (for the 128GB model) and $1,249 for the larger iteration, and £899 and £1,099 in the UK for the same capacities. It’s very similar to the iPhone X, which also costs $999 / £999 for the 64GB model and $1,149 / £1,149 for the 256GB variant… so either way, you’re spending a huge amount for your smartphone. These are two incredibly powerful and well-designed phones - and something that will cost you a lot to own. We mean a lot. However, for that money you’ll get handsets that you’ll struggle to tax too hard, have excellent screens, camera capabilities and top performing battery life in their classes. Is it too much? Is it fair to pay an extra $100 for 256GB more storage and the S Pen capabilities? 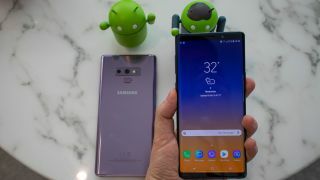 Check out our hands on: Samsung Galaxy Note 9 review to find out.